A good knife is an essential tool for all types of climbing. It’s used for cleaning manky tat off at a rap anchor, cutting cord for a v-thread, removing tape gloves, cutting a stuck rope out of a crack, slicing up a crag apple or cheese and much more. 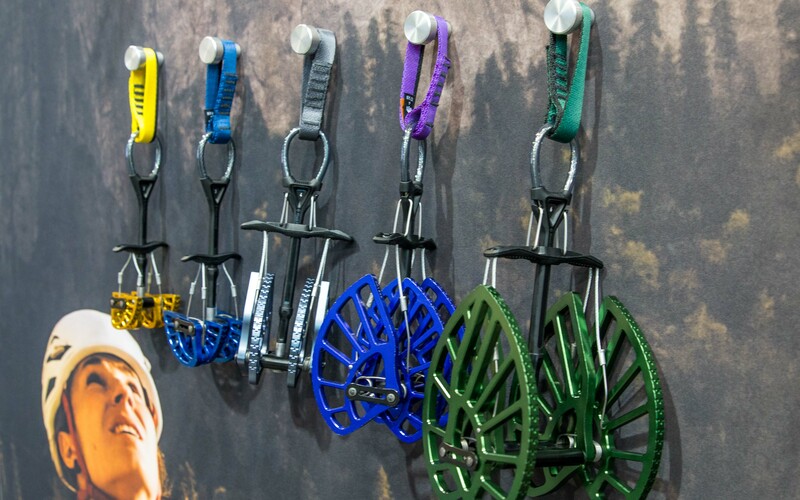 Despite the obvious importance of a knife in climbing it doesn’t seem to get discussed much by climbers, many stores only carry 1 or 2 options and there are not many reviews written by climbers for climbers. 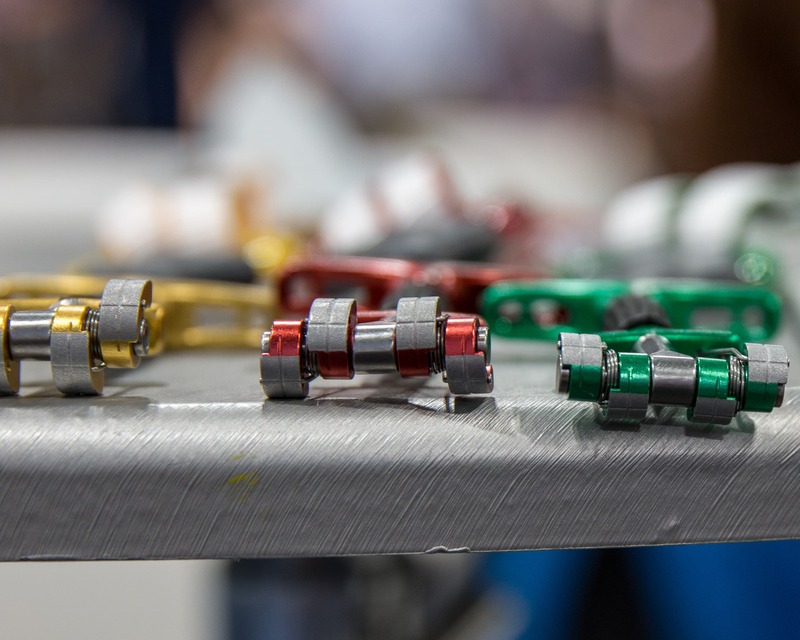 When we recognized this small void in the spectrum of climbing gear reviews it was incumbent upon us to address it with a solid comparison review of the main climbing knife options out there. Now I’m talking climbing knives only mind you, not multi-tools or pockets knives. 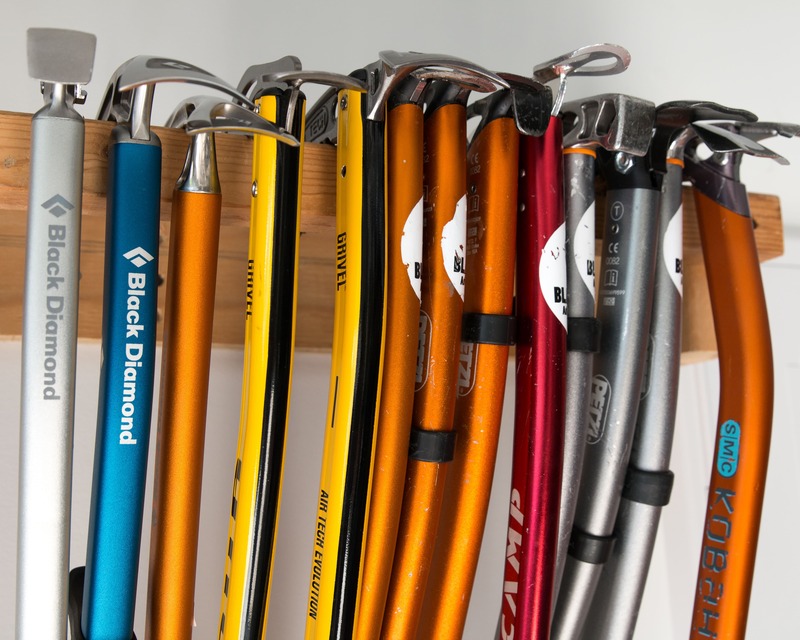 For this comparison we look at 6 different climbing specific knives from 4 different companies: CRKT, Trango, Gerber & Petzl and compared them head to head. The Piranha next to a battery for size comparison. 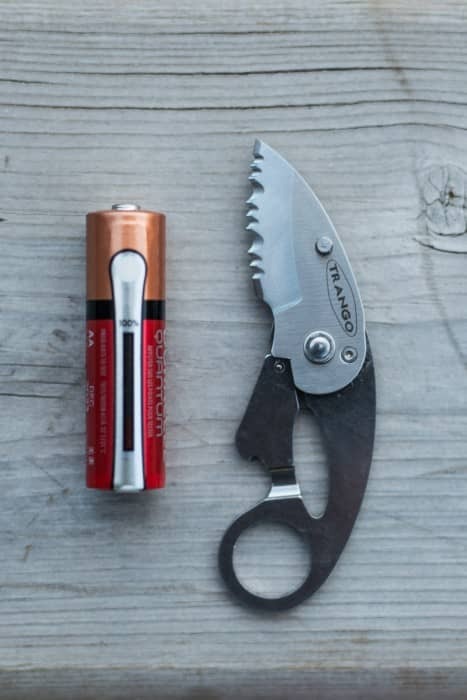 We start with the go-to for many climbers, the Trango Piranha, a widely available, inexpensive and functional micro climbing knife. Drop point, serrated edge blade made of 440C stainless steel (hardness of 58-60 HRC). The Piranha is small. It has a small blade, a small handle and a small weight. While this can be great while clipped to the back of your harness the small handle makes the knife harder to hold securely and much too small to use effectively with gloves. I would not recommend it for use in the winter. In the summer, however, it can be quite effective at cutting with its high quality steel blade and serrated edge while the small size keeps the knife light. When holding the knife my pinky finger does not touch the handle. 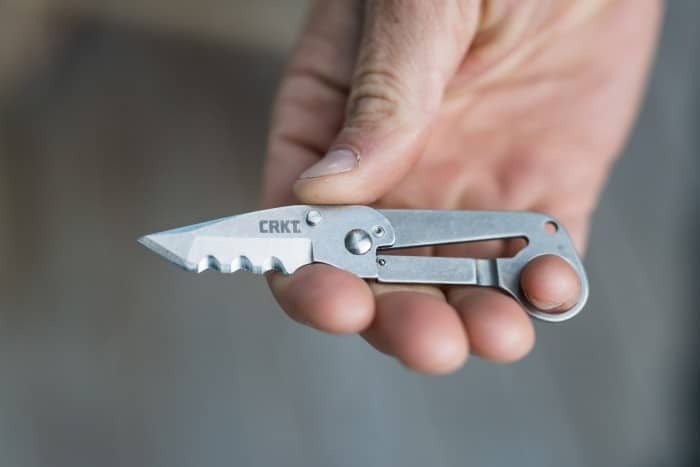 The knife has a carabiner hole in the back that serves double duty as a lock as well as a way to attach the knife to a harness. When there is a ‘biner in the hole is stops the blade from opening… well most of the time. Assuming you use a light-weight carabiner (of course) then if the carabiner is rotated into a specific position the blade can be opened. Extremely unlikely to happen but most definitely possible. 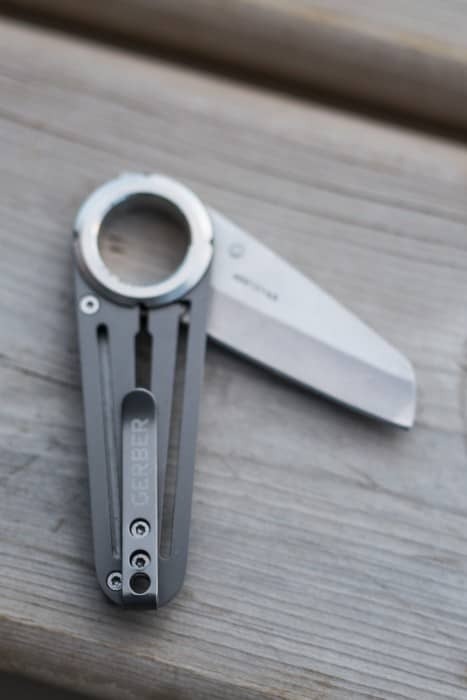 The blade is partially open here so that it’s in-line with the carabiner hole. There is a bottle opener built into the back of the handle which I found a little strange for a knife that is designed to be as light as possible. 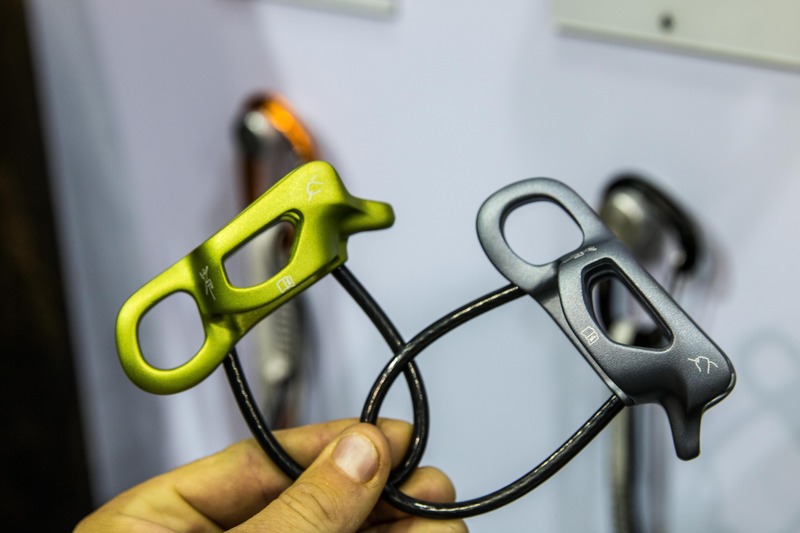 The extra weight that was used in adding the bottle opener could have been utilized to make the handle a bit more secure and, in my opinion, the feature is redundant as any climber worth their salt knows how to pop a beer cap with a carabiner. Pros: Light, inexpensive and effective at cutting ropes, cordalette and tat. 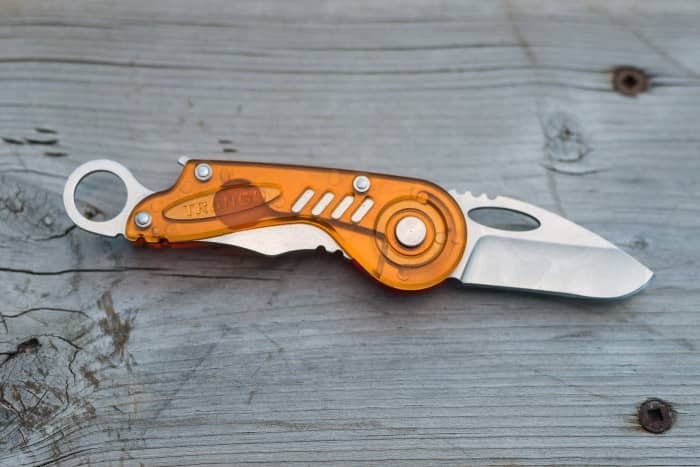 Overall: Excellent value in a quality micro knife for summer rock and alpine climbing. The NIAD next to a battery for size comparison. This much anticipated brain child of legendary Nose climber Hans Florine is a superb, purpose designed, multi-pitch micro climbing knife that has adopted and improved upon many of the features of the Piranah. 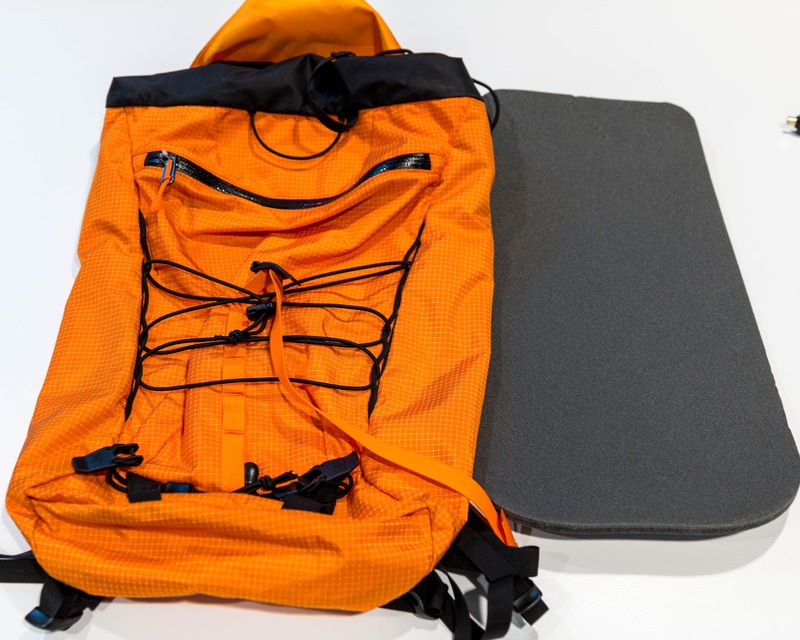 Light weight and functional, a great way to shed a little weight on long climbs. Tanto style tip with a serrated blade made from 5Cr13MoV (hardness of 56-58 HRC). This knife is unbelievably light! 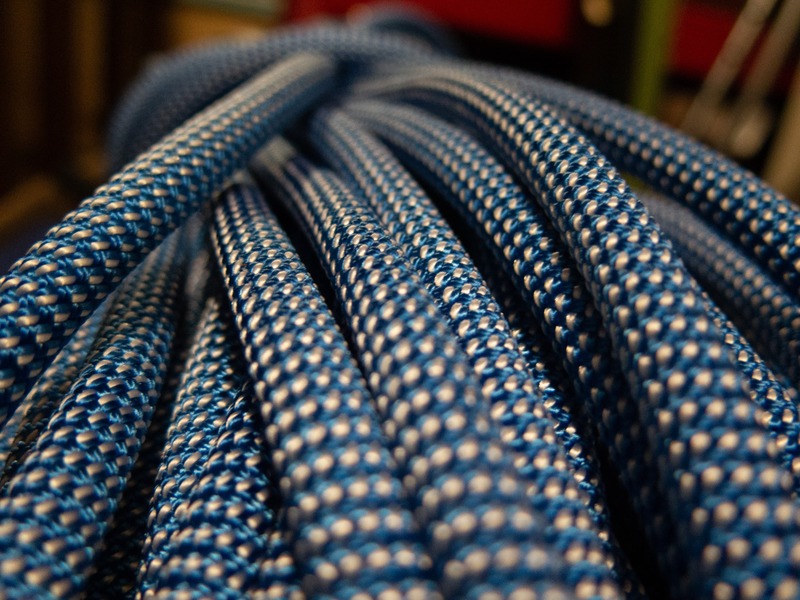 There is no reason not to have it on your harness when out climbing. It’s also surprisingly ergonomic for such a small knife. I found that if I put the tip of my pinky finger through the small carabiner hole in the handle the knife was well anchored in my hand and I was not at all worried it would slip. Still too small to use effectively with gloves and so it’s primarily a rock climbing and summer alpine knife. The NIAD has a large handle for such a small knife. 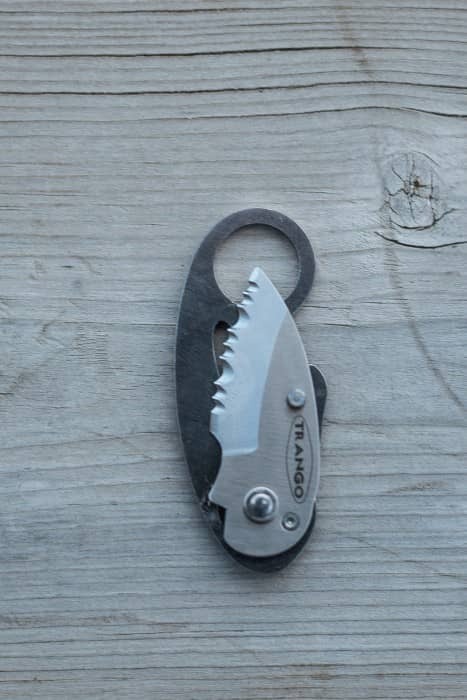 As with the Piranha, this knife has a carabiner hole in the back that serves double duty as a lock. When there is a ‘biner in the hole it stops the blade from opening no matter what carabiner is used. The knife blade must open across the carabiner hole. 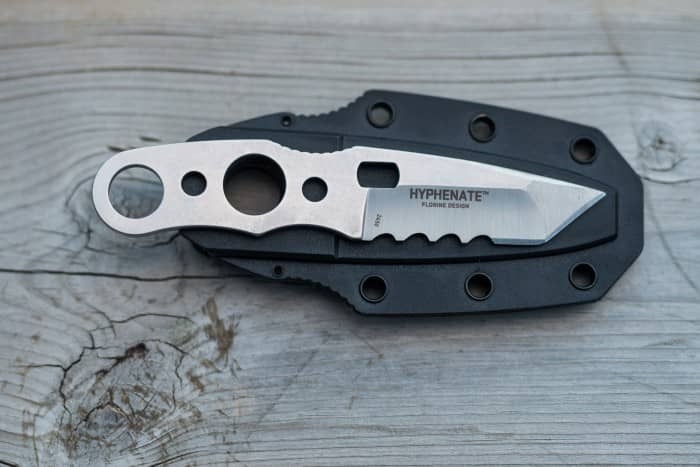 The Hyphenate is unique in that it is a fixed blade knife instead of the folding type knife which is much more commonly used in climbing. While I was a bit sceptical of this knife before I had an opportunity to use it I’ve come around to its simple elegance and effective cutting edge. Designed by Hans Flourine as a climbing knife that can also be used around camp or on those multi-day alpine routes. As it has a fixed blade the knife is very easy to care for and keep clean, eliminating stick/dirty knife issues if using it to cut up some cheese or an apple at lunch. The knife can go either direction into the sheath and is held in place by a carabiner. The sheath has holes in it that line up with holes in the handle of the knife so that it can be secured in the sheath. 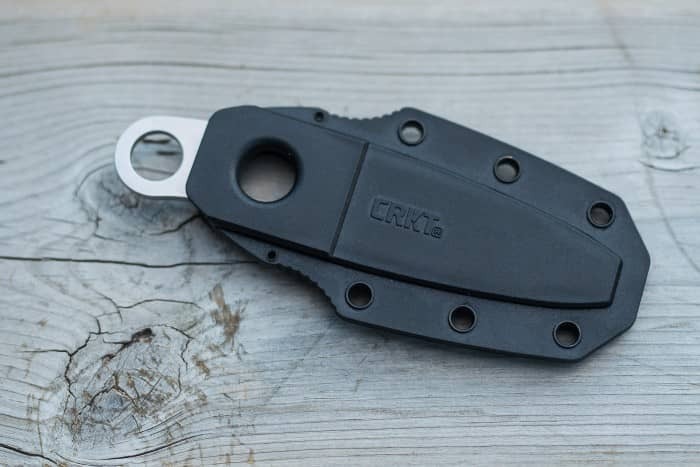 However the relatively small diameter hole in the handle and sheath do not work well with all carabiners with the compatibility depending on the nose thickness and geometry of the corners and spine of the ‘biner. With some experimentation I found that the Edilrid Pure Screw worked great for a locker option while the Metolius FS Mini II worked great for a light non-locker. When the sheath and knife are on a carabiner they carry quite well on a harness. Despite being a larger knife the small handle makes if feel small in the hand. The handle feels small in my hand, there is only room for my first three fingers leaving my pinky finger hanging. 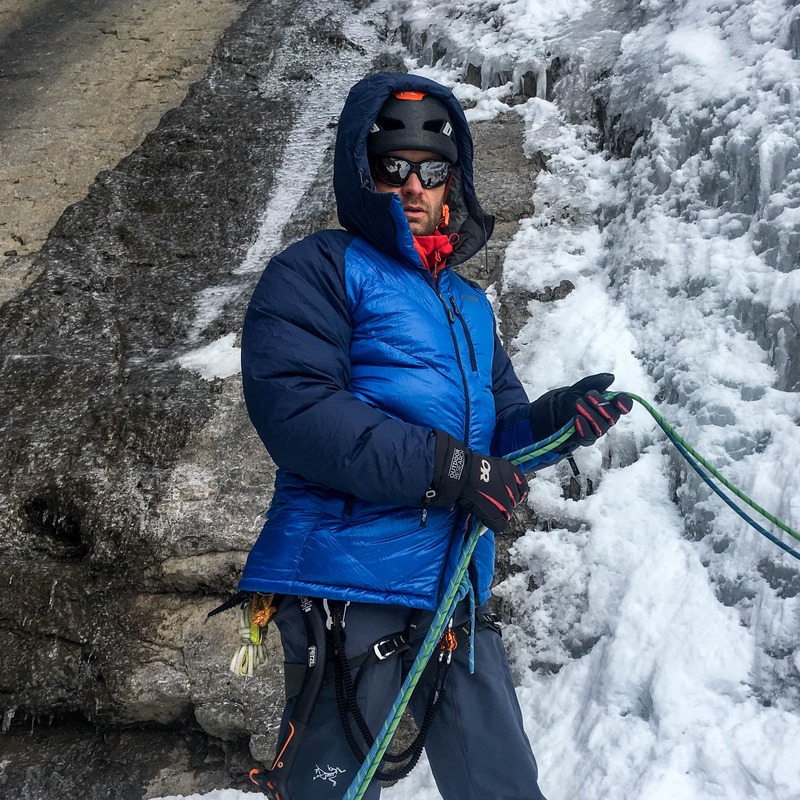 When wearing an ice climbing glove the handle feels even smaller. That being said one of the female testers with smallish hands really liked the size and feel of the handle. The backward swept serrations on the blade make it very effective in cutting ropes and tat, just a few quick swipes and you’re through. Pros: Simple and very effective at cutting tat and ropes. 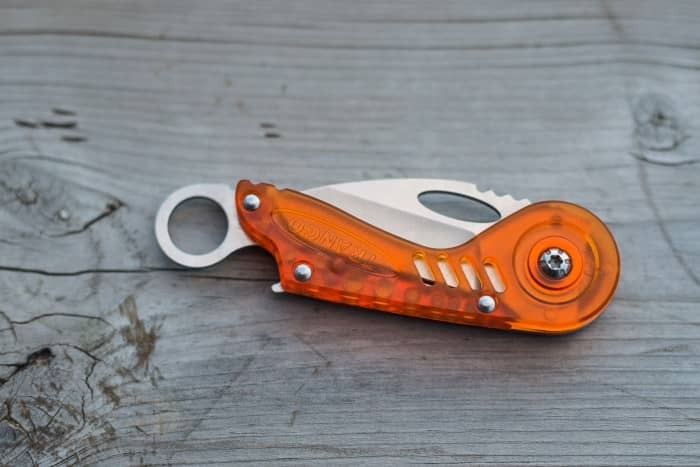 The Barracuda is a brightly coloured futuristic looking folding knife. While heavier than the micro-knives it’s still relatively light and a great all-round knife. Drop point on a fine edge blade made of 440C stainless steel (hardness of 58-60 HRC). Composite handle made of unknown types of steel and plastic. The Barracuda’s blade is not serrated like many of the other knives. This means that it’s easier to sharpen but the trade-off is that it doesn’t cut through tat and ropes nearly as easily. The blade is fairly short despite having a longer handle and is not serrated. I found that the knife had a short blade given the length of the handle though it’s long enough for anything I would need on a climb. Like the Piranha, the Barracuda has a bottle opener built into the back of the handle. The designers over at Trango must like their beer. While I can’t fault the appreciation of a good beer I don’t necessarily find this a useful addition in climbing specific knife. 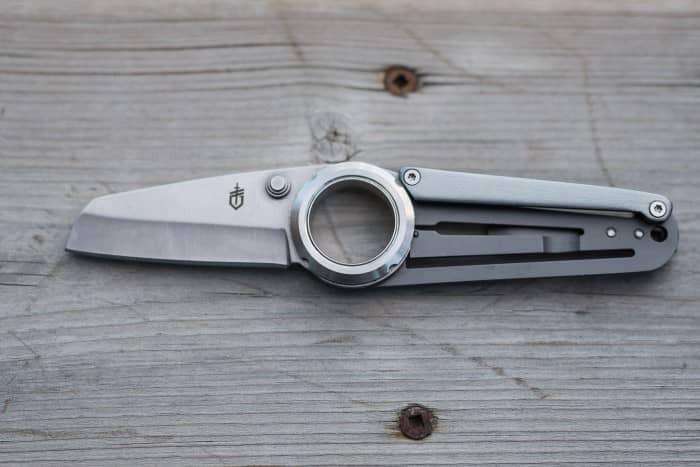 The long handle on the Barracuda allows for a firm grip on the knife though it still feels small and not overly ergonomic due to the large round pivot at the front which pushes the index finger back and the narrow carabiner clip at the end. However, the large handle allows for a firm grasp with gloves making the knife a good option for winter use. Not a very ergonomic feeling handle. Unlike the micro knives above there is no way to lock the blade closed. However, as it has a relatively stiff action, a small keeper on the blade when closed and the tip is buried in the handle I think it would be next to impossible to have it open in a fall. It could potentially open if something caught on the cut-out in the blade that is used to open the knife, unlikely but possible. 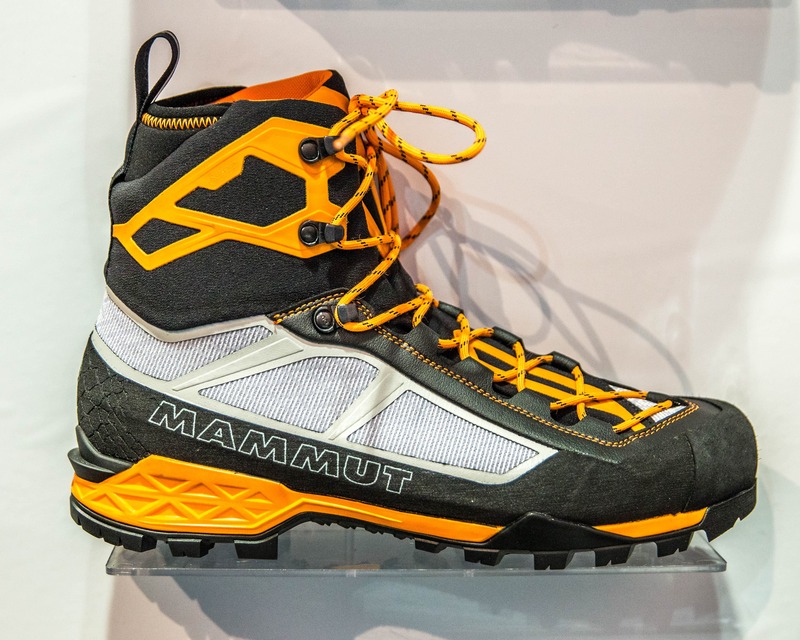 Overall: A good all-round climbing knife for summer and winter. 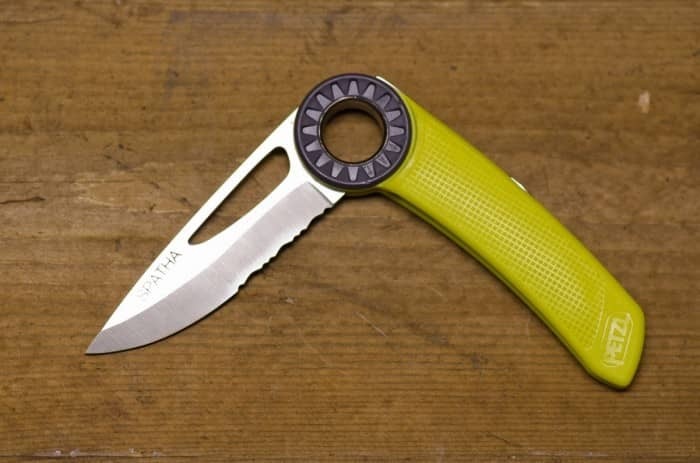 The remix mini is one of the heavier knives looked at and the only one not specifically designed for climbing. That being said it’s a very functional climbing knife with some great features and it looks really cool. The blade is not serrated so it’s easier to sharpen but the trade-off is that it does not cut through tat and ropes as easily. 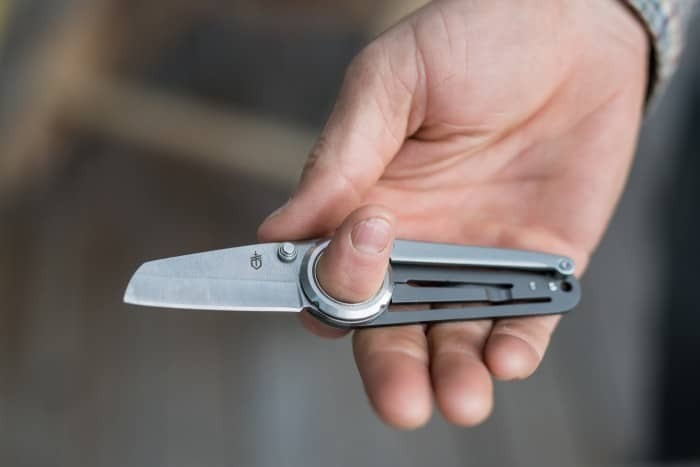 As can be expected this larger and heavier knife feels very secure in the hand and the index finger can be placed through the pivot point of the blade where the ‘biner goes if additional security is needed though this it’s not a comfortable cutting position. Index finger through the hole in the pivot of the Remix Mini. The blunt tip is great for cutting off tape gloves. One of the features that I really like about this knife is the blunt shape of the tip. This shape has done away with a sharp point while keeping the sharp blade. The big upside to this design feature is that this knife can be safely used to cut off tape gloves by sliding the blade between skin and tape as there is no sharp point to jab yourself with, the ideal Indian Creek knife. 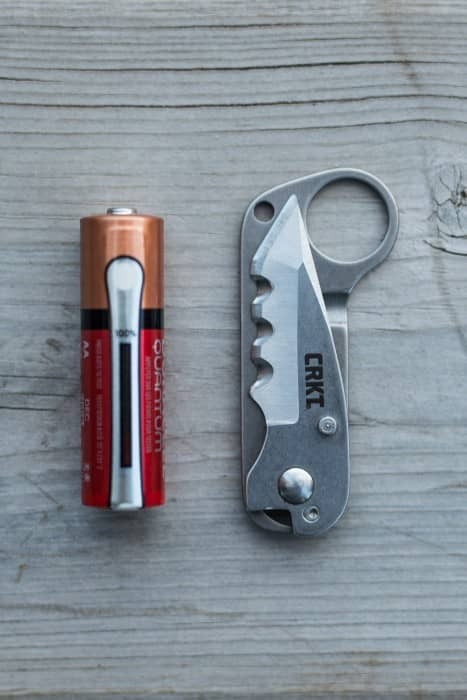 The Mini comes with a pocket clip that is obviously not needed when climbing. In an effort to reduce the weight of the knife I tried to remove it. Unfortunately, the clip is held on with extremely tight torx T6 screws that I simply was not able to unscrew, even when holding the knife in a vise. The clip could be broken off but that seemed a little extreme. The Remix Mini is stiff to open and close so it’s very unlikely / next to impossible that it would open when hanging on the harness. However, I’ve carried this knife on my harness for numerous long climbs and found that over time the keepers holding the knife together at the pivot point would unscrew themselves. This would occur over long periods of carrying the knife but not using it. The remedy is simply to tighten it again by hand, a custom tool is required to do anything more. 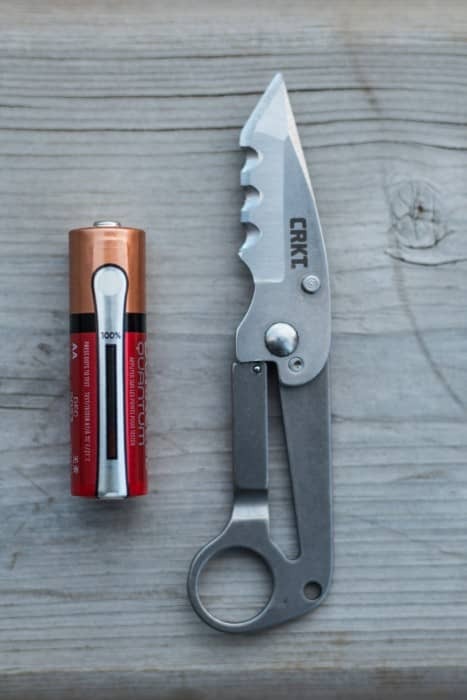 Overall: A great cragging knife with a blade that is large enough to be useful around camp, perfect for Indian Creek. The new and improved Spatha in yellow, it comes in blue as well. 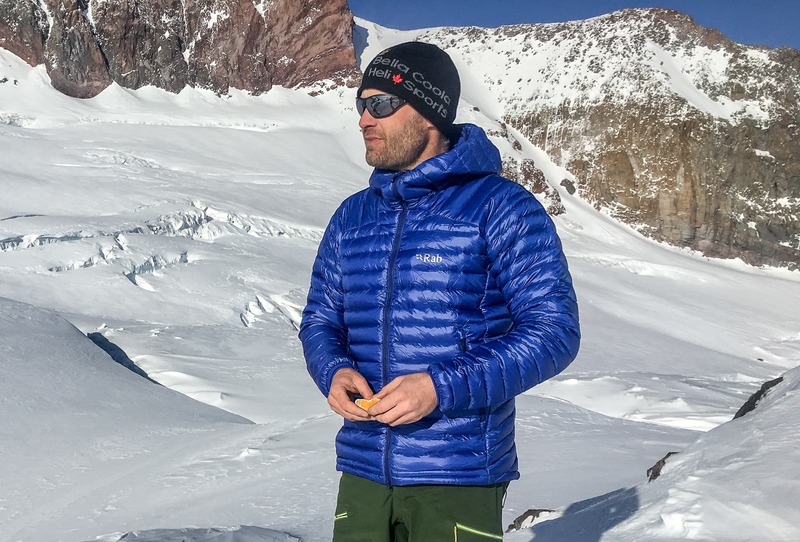 This popular and widely available knife, the go-to for many alpine and ice climbers for years, was recently updated. Some of the new features include a longer textured handle, a longer blade, a blade lock and a cut-out on the blade to facilitate opening. Amazingly, they even managed to make the knife a bit lighter as well. Tanto style blade with a combination fine/serrated edge made of INOX 12C27 of stainless steel (hardness of 54-61 HRC). The upgraded Spatha is surprizing light given the size of knife. 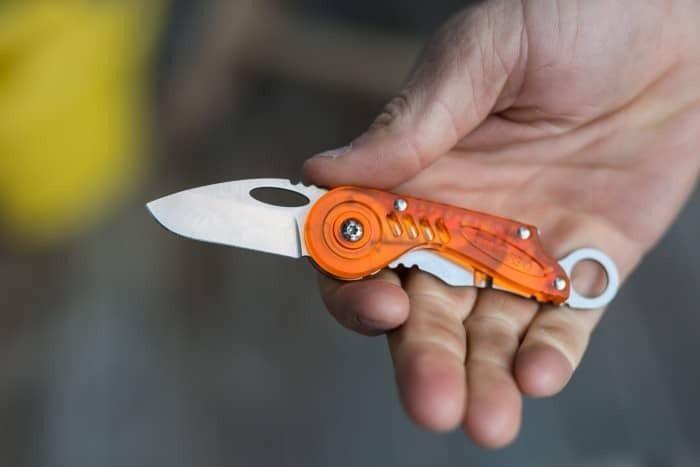 It’s both the largest and the lightest of all the non-micro knives reviewed. This was accomplished by removing all of the metal from the handle except for the blade lock and putting a large cut-out in the blade. 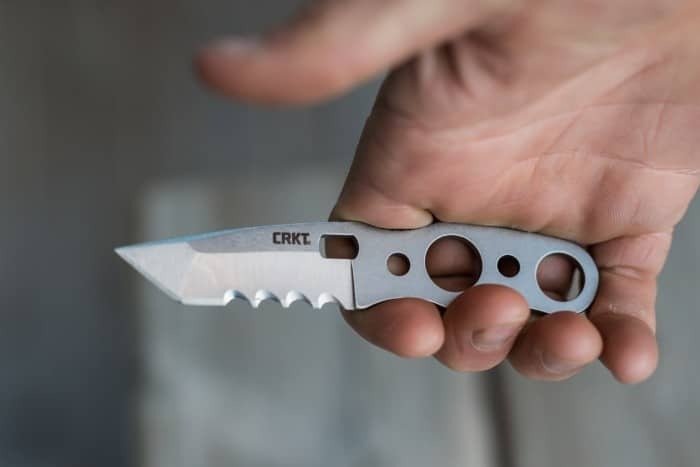 I’m curious to see how this knife will perform over the long term given the lack of metal in the handle and I would be very careful using it to pry anything. That being said, at the end of the day I’m willing to sacrifice a little durability for a light climbing knife with a big handle and after 2 years I have yet to have an issue. The large handle is all plastic except for the blade lock which can be seen on the back of the handle. The blade is also very long for a climbing knife, while this allowed Petzl to provide both a serrated section (3.5cm next to handle) and a fine edge section (4cm at the tip) I’m not convinced that I need such a large knife blade when climbing but it could be handy around camp. 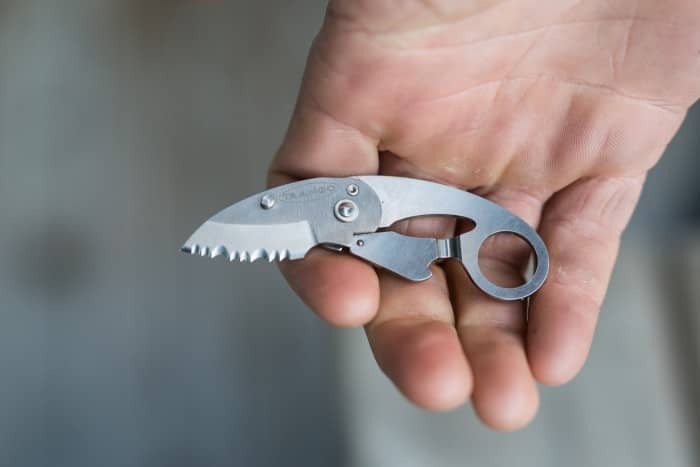 Like all the other non-micro knives reviewed this one does not have a lock to hold the blade closed but the stiff action would make it just about impossible to open in a fall. The Spatha can easily be opened then unlocked and closed with gloves on, you will need two hands though. One unique feature of the Spatha is that it can be opened by using the textured grip around the pivot point. Simply pinch the grey pivot and twist the handle. The blade will not move, just the handle, opening the knife. Simple and very functional, especially when wearing icy gloves. The previous version of this knife had the same feature of course but it’s nice to see that Petzl kept it. The large handle has room for the entire hand and so is easy to hold with gloves. 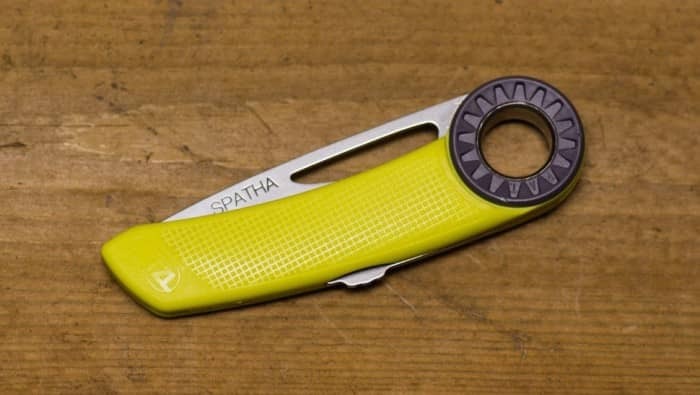 With it’s big handle the Spatha feels secure in-hand with or without gloves and the new blade lock can also be easily operated with gloves on. Some texture on the back of the knife for the thumb would have been a nice feature as well, maybe on the next generation. Pros: Lightest of the non-mirco knives, large handle, easy to operate with gloves. Cons: Long-term durability is a question given the lack of metal in the handle to support the blade (2 years and counting without and issue at this point). 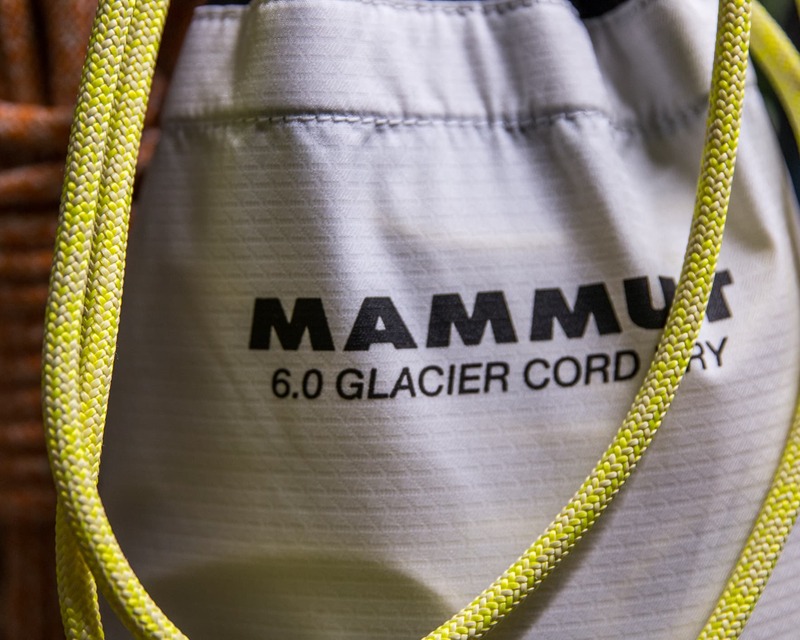 Overall: Great for winter ice, mixed and alpine climbing where a glove friendly knife is key. Now if I had to pick just one of these knives to carry when climbing I would be hard pressed to choose. They all have different strengths and weaknesses and so the question almost becomes what type of climbing do you do the most of. However, if I was a very well rounded climber and was to pick a single jack-of-all-trades knife it would be the Barracuda. 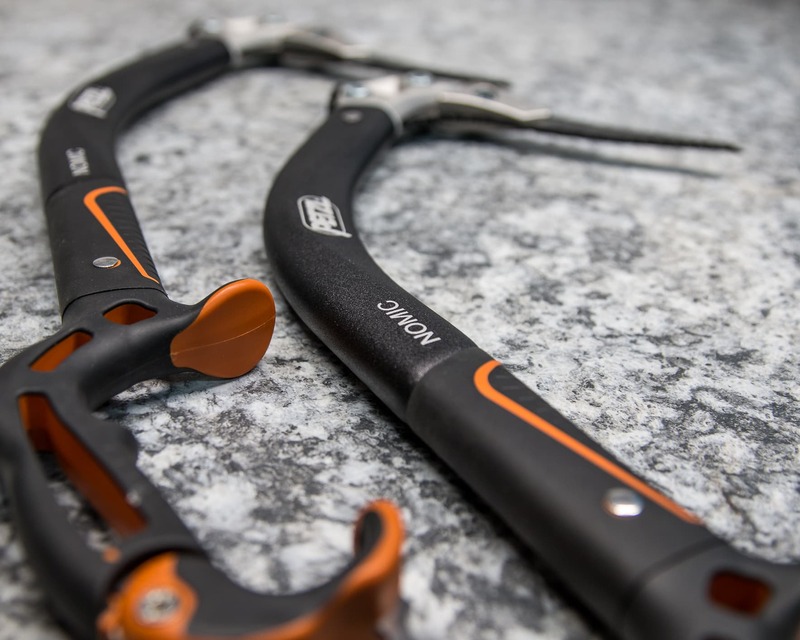 It doesn’t excel in any one area or use however it is a strong performer for all types of climbing and has a proven track record. Now, if I could have two knives, which is reasonable given their relatively low cost, I would choose the NIAD and the Spatha. 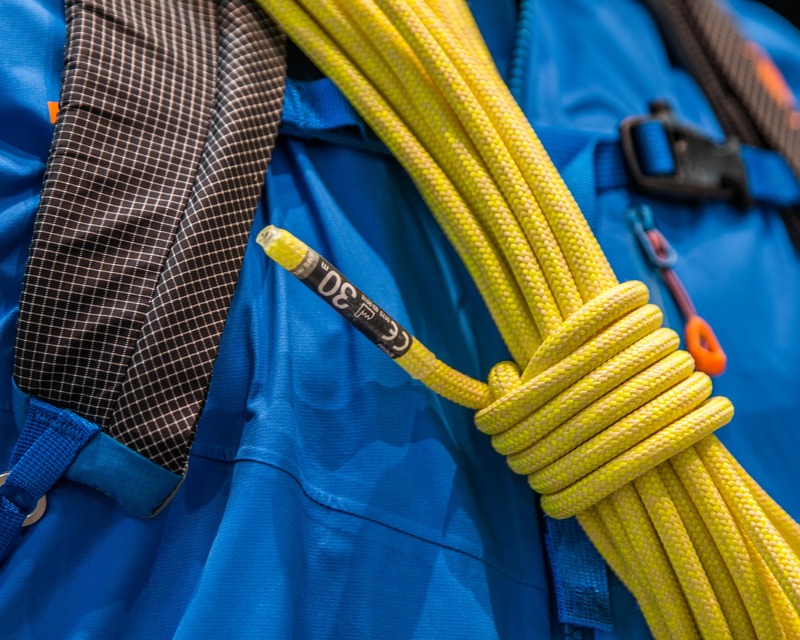 I do a ton of multi-pitch rock and summer alpine climbing and the NIAD is purpose designed for that type of use and fits well in my hand. 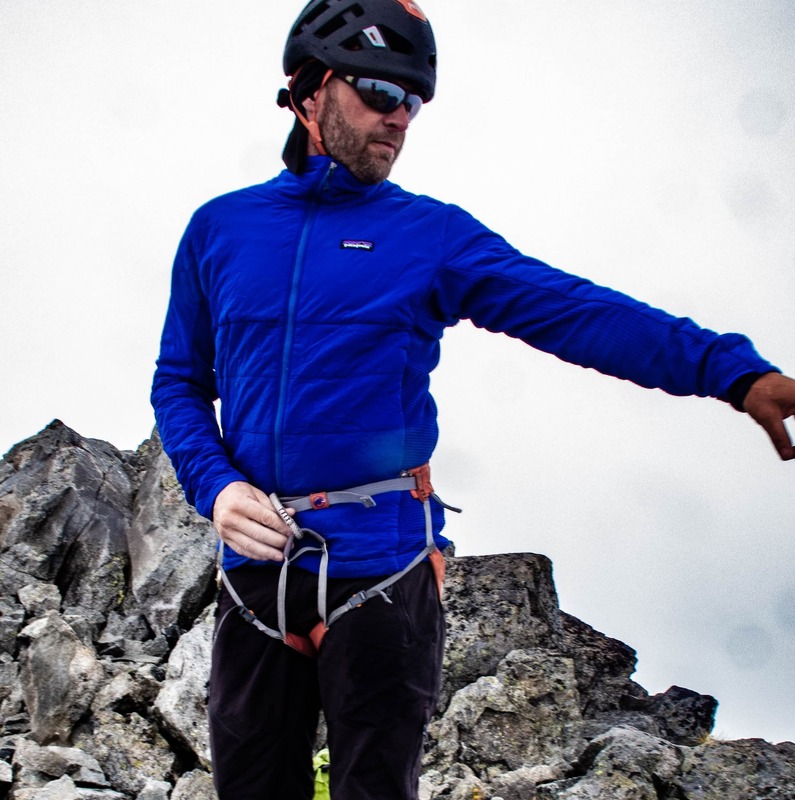 The Spatha I would take on snow and ice climbs, it’s light and easy to operate with gloves. 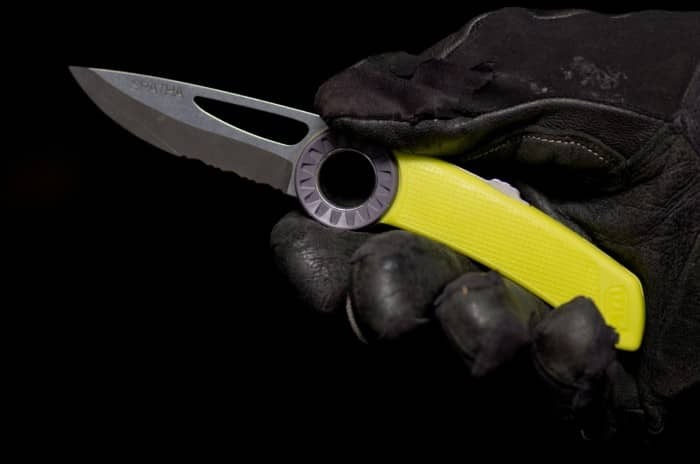 If we’ve missed reviewing a knife that you think is great for climbing please let us know! 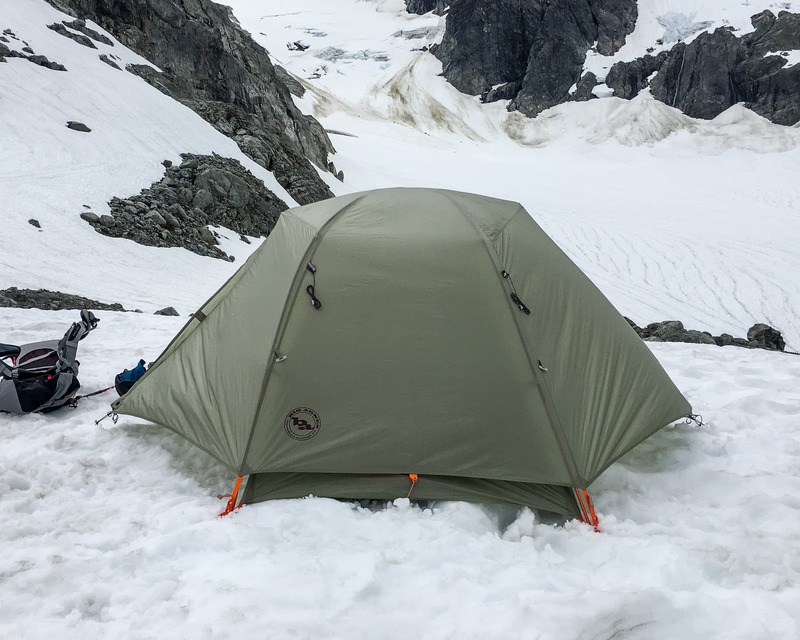 And thank you to Petzl, Gerber, Trango and CRKT for providing knives to compare and Raf at thealpinestart.com for the photos.